Plants transition from groundcover to wildflower when erect stems emerge. 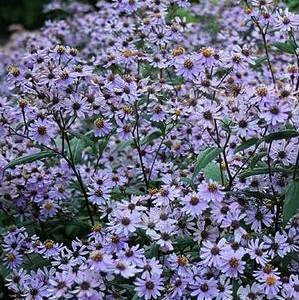 The stems usually develop a red-purple color and bear sessile leaves and large lavender blue daisy flowers in August well into October. Pollinator and host for butterflies and moths. Best in morning sun or dappled shade in average well drained soils.